With a preschool jungle theme you can teach your child about the plants and animals of the jungle. Your child can also practice his numbers and letters. He will have fun doing crafts and other hands-on projects. Another idea is to visit the zoo. Many zoos have animals of the rainforest. Below are ideas for number, letter, and other educational activities. There are also crafts and other hands-on activities that you can do with your child. I could not find a jungle themed alphabet book. I decided to use Chicka Chicka Boom Boom by Bill Martin Jr. and John Archambault. The reason that I included it in the preschool jungle theme was that the tree is a coconut tree. Coconuts grow in tropic and subtropics. I also really like the book. When my children were young we had tubs of animals that could be counted. 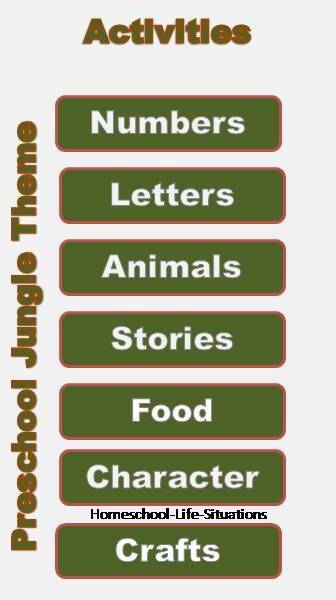 Learning Resources has a jungle animal set. The set has sixty animals. The set contains tigers, antelopes, lions, rhinos, hippos, cheetahs, zebras, gorillas, elephants, goats, antelopes, and ostriches. The one thing that I do not like about the group is that some of the animals live in grasslands not jungles. After your jungle study your child could group the set into animals of the grasslands and animals of the jungle. 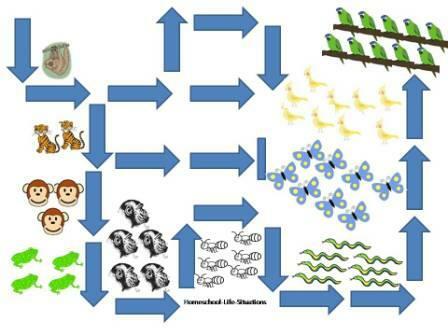 Besides sorting and placing the animals into different groups your child can count. There are several ways to count. Count each animal. Count the groups of animals. Since there are five animals in each group you could count by five. Your child will learn that some animals kill other animals. It is the law of the jungle. You could use this fact to teach about subtraction. You can also download my free count the jungle animal maze. It is a PDF file so you will need adobe reader. Library books with a preschool jungle theme can also teach math concepts. I liked the book Over the Jungle a Rainforest Rhyme by Marianne Berkes, Illustrated by Jeanette Canyon. Each page has a jungle animal mother and her young. The first page is about a marmoset and her one child who swing through the jungle the rhyme continues until there are ten howler monkeys. On the last page you are to find the animals hidden in jungle plants. Besides math concepts Over the Jungle a Rainforest Rhyme has information about each of the animals mentioned in the poem. The poem can even be sung to the tune of Over the Meadow. This is one of my favorite picture books about the jungle. Jungle Drum by Deanna Wandrow is about how the animals become quiet and listen to the drum. When the drum is quiet the sounds of the jungle can be heard. I love the cut-paper illustrations by Susan Swan. I also think because of the sounds of the drum, water, and animals that preschoolers would love to have this book read over and over again. I like the rhyme in We’re Roaming in the Rainforest an Amazon Adventure by Laurie Krebs and Anne Wilson. After the story there are some facts about the Amazon River. You can see a map of South America and the countries that the river flows through. There is also information about conservation, people, and creatures of the Amazon. Jungle Song by Miriam Moss and Adrienne Kennaway is about a baby tapir that follows a spider through the jungle. He sees lots of different creatures. Jungle Jamboree by Kimberley Knutson is about children on a rainy day imagining playing in the jungle. The book is not really about the jungle but would be a good read for young children. Maybe you could also pretend that you are in a jungle. I need to also mention the classic Jungle Book by Rudyard Kipling I received a free version for my Kindle. I liked how Rudyard Kipling made the animals believable. The book is definitely better than the Disney movie. When I was looking for animal books for my preschool jungle theme I found that it was better to search for books about the rainforest. Some of the jungle books included animals of the African Savanna. Anyway here are two books that I found in my local library about jungle animals. Explorers Rainforests by Anita Ganeri is part of the explorers series. The book has interesting illustrations of the tropical rainforest. You can read about what lives in the treetops, the canopy, and the forest floor. There is also a section about the Amazon River. In the book you will find out about people who live in the rainforest. Explorers Rainforests also mentions the threat to the jungles and conservation measures. There is not a lot of information about the plants and animals of the jungle but it could be used to introduce the subject. I really liked Animal Trackers around the World in the Jungle Be an Animal Detective by Tessa Paul. The book gives some facts about common jungle animals. Your child can learn about the tiger, marmoset, sloth, macaw, jaguar, gibbon, bat, orangutan, capybara, and the pygmy chimpanzee. Each chapter of Animal Trackers has pictures of the animal and its young. There is general information about the animal in larger print. For each animal it gives more information in smaller print. Some of the facts include what the animal eats and how it takes care of its young. Make animal mask out of construction paper. Make a monkey with a circle of brown paper. Add ears. Use a lighter shade of brown for the face. Add eyes, a nose, and a mouth. Use orange construction paper to make a jaguar. Cut ovals for eyes. Add black spots with a black colored pencil. Add whiskers with chenille wire. Make Butterflies out of cupcake papers and a six inch piece of chenille wire. Fold the cupcake holder in half. Then fold the ends to the center. Place the wire so that one end is slightly above the paper. Bend the wire around the paper so that the wire makes the body and antenna of the butterfly. Fluff out the paper. Have your child dip fingers in nontoxic water paint or ink. Make fingerprints on a piece of paper. Add details to the prints to make animals or insects. Make palm trees out of paper towel rolls and green paper. Cut a two inch by eight inch piece of green construction paper and round the ends. Have your child make cuts with scissors on both sides of the paper. Fold the paper in half. Make slits in the paper towel roll. Push the green paper into the slits. Make vines by rolling strips of brown paper. Add green leaves if you want to. Have your child cut a spiral snake. With a round piece of paper have him cut around the circle. With each turn have him cut toward the center. Draw eyes and tape a piece of red yarn for a tongue. 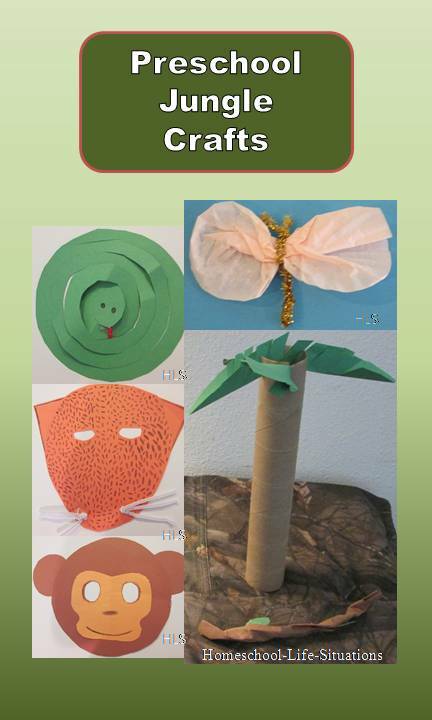 Here are some ideas for character studies to go along with your preschool jungle theme. Most monkeys such as the spider monkey, the howler monkey, and the marmoset, and the gibbon live in social groups. They call to each other to keep in touch and to warn others of predators. Ants are strong hardworking creatures. The leafcutter ant can lift a piece of a leaf that is fifty times its weight. The driver ants have powerful jaws. Also in Proverbs we learn that we should look to the ant as being hardworking (Proverbs 6:6). The Jaguar is a patient cat. It will follow its prey for long distances before pouncing. Also when it is hungry it will go to a river bank and wait for other animals to come to drink. Serve tropical foods fruits such as mango, coconut, guava, papaya, and banana. Make pancakes that look like monkeys Make round pancakes and add round ears. Make sandwiches that look like monkeys. Cut the bread in a round circle. Add ears. Use raisins as eyes, nose, and mouth. Serve “ants on a log” Cut a piece of celery for the log. Fill with cream cheese or peanut butter. Add raisins for ants. You can continue your preschool jungle theme outside with these ideas. Go to the park and climb the jungle gym. Or pretend that the slide is a waterfall. Swing on the swings like a monkey. I hope that you have enjoyed my preschool jungle theme. Here are more ideas for different preschool unit studies. Leave Preschool Jungle Theme for Homeschooling Preschool.